We have created a Kiddie Pool at Adaptive Mall.com. It is program they have set up to help disabled children get the funding they need for items they require. As you may know most adaptive equipment is very pricey and hard to obtain. We have picked out a few items for Abby as scoliosis is becoming apparent although not yet confirmed. She needs extra support as well as help with bathing. The great thing about this site is that anyone can contribute and anyone can also sign up their own child or grandchild. Once the items have received their total amount they will confirm sizing with us and ship to us directly. So for those of you who have always wanted to help but don't really care for sending money to foundations this would directly benefit Abby. To contribute click here and it will take you directly to her page. Here is the promised video. She was dancing to Daddy humming or dancing to the Penguins whooping up on Carolina in the playoffs. She is the sweetest thing ever. 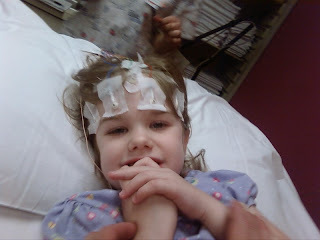 We took Abby in for an EEG this morning to check for seizures. 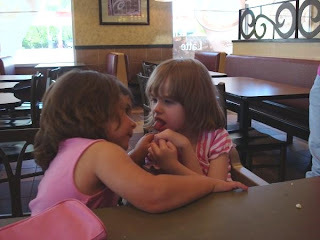 This is something par for the course with Rett Syndrome and we usually do it yearly. However Abby has been having some,(episodes) that we felt needed further testing. She isn't having full grande seizures but it seems to be more than her standard Rett tremor. She is having episodes where she just kind of goes blank and stares and sometimes becomes a little cross eyed. Sometimes we are able to snap her out of it and sometimes not. I didn't see anything different in her with the testing. I think the flashing lights are harder on me than her. Strobe lighting has always made me nauseous. She didn't even flinch. She just looked at me like what the heck Mom? We came home and spent the rest of the day in bed after only getting 3 hours sleep. She awoke to some pretty awesome hair and I got video of her Princess Messiness dancing with her Dad. School is out for the summer. For now at least. Abby will start a 4 week ESY in June. So far we are not off to the best start. I dressed her in shorts and a tshirt yesterday and she came home with a pretty wicked sunburn on the tops of her legs from where her shorts end to her sock line. I am hoping if she was on a lap or in a chair outside that someone wasn't careless enough to just let her sit there and burn in the sun. Not happy. I am planning on sending care notes that she is to be under shade if sun is beating down and she is stationary. She got pretty sick last night. We had assumed the other day when I was quite ill that I had gotten food poisining from some bad almonds. She had all my same symptoms. It was not an easy thing to watch her wretch while I released vomit from a tube in her abdomen all night. We are pretty tired today and I am giving her slow feeds of half formula half pedialite and she is tolerating them so far. And as long as I keep her Wiggles on a steady loop she should stay happy. This is Abby's best friend Madison. These two absolutely adore each other. 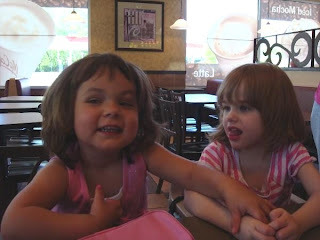 Madison is Abby's friend,protector,hands and voice. The teachers told us early in the year that they seemed to be forming a special bond. At the Christmas night at school Madison was everywhere Abby was. Even with us she watches and looks at you with this little face of hers that says one wrong move with my Abby and you're mine! Abby and Madison have different needs and Madison will be moving on in the school system in a few weeks.....ok even typing that made me start to cry. Yesterday Madisons Mom and I took the girls to get their portraits taken together and bought them some pretties. The portraits are incredible. Wish I could post them. Afterwards we went to McDonalds for lunch. The girls sat right next to each other. We took a few pics. They are just too cute. The pic below was right before Madison got an ABBY kiss to the forehead! So funny. I am thrilled to report that we raised over 40,000 dollars at the strollathon in St Louis this weekend. Money is still coming in so I should have an updated number soon! Woot Woot! The pic above is Abby and Daddy at the Australian exibit at the Zoo. She loved the roos! This is Shannon and Miss Lyss. Our buddies from here. We spent two days at the zoo. The girls loved it! Abby and Daddy and Shannon wrestling a cobra! This was the penguin and fish tank. It was stinky and cold in there but you get really close up to the penguins and Abby loved it ! This weekend we drove to St Louis with our friends to attend the St Louis Strollathon for Rett Syndrome research. Two Rett families in one Mini Van with 2 wheelchairs a toddler,2 feeding pumps. Countless bags and no one got punched. We had a great time. I will be posting more pics from this event as well as total fundraising numbers as they come in. Above is Abby the morning of the Strollathon. She was a happy camper! Shannon, Alyssa and Abby on the way. I love this little girl. She has the best personality and sense of humor. Me and Shannon. She is the local IRSF rep and my good friend. She was the first to contact me after Abby's diagnosis and she is an absolute rock and gives me so much hope and inspiration and has really taught me how to deal and be a special needs Mom. Feels kinda strange having to learn life lessons from someone 10 years my junior. Marla Black and me. Her daughter Sydney is absolutely stunning-and so bored with people telling her. She was great. I haven't gotten an official count but I think their was between 17-20 girls and I was absolutely amazed that the number was so small considering the number of people that were there. Not all of us get that kind of love and support from their friends and families. I hear so many storied of friends and family who just turn tail and run at the diagnosis and there were several families there that had dozens of people walking with them. Absolutely brought me to tears. It was wonderful. I want to thank Shannon and her family for being so wonderful. They made me smile all weekend and I have more to post later because we spent 2 days at the zoo and took a trip to the Childrens Museum. If you ever get a chance to go to St Louis it is a beautiful city and the people are absolutely the best.